Are you using a basic phone and haven’t yet experienced the power of mobile internet? Are you not able to finalize a MB-based data plan that suits your requirements? Are you scared of data charges eating away your prepaid balance? Are you consciously staying away from full-time mobile internet plans, but struggling during emergencies? Idea Cellular is giving away 200,000 hours of free internet access, over the next 20 days, to its users through the web pass service on Opera Mini. For users who have never experienced the internet from their mobiles before, this is the easiest way to shed inhibitions and get online. This monsoon season, have a blast on your Idea network with free internet powered by Opera Mini! Get online NOW! To enjoy free internet, Opera Mini users simply have to go to the Speed Dial page in Opera Mini and click on ‘Idea Web Pass’. 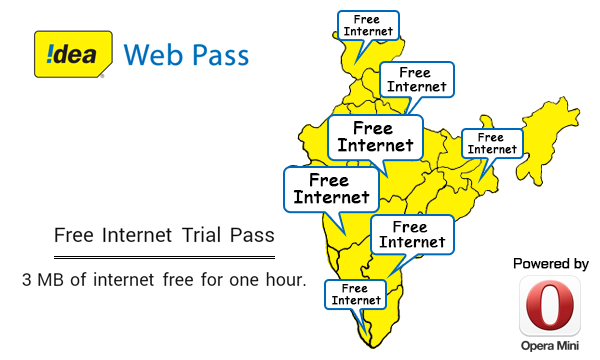 From here, they can select ‘Free Internet Trial Pass (3 MB)’ from the list of web passes. Users can avail one web pass each during this campaign, which entitles them to one hour of free internet, upto 3 MB, during that day. Idea subscribers who don’t already have Opera Mini on their phones can visit m.opera.com and download Opera Mini absolutely free. 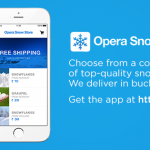 Opera Mini works on almost all kinds of phones, from basic Java phones to the latest Android and iOS smartphones. Opera Mini’s unique compression technology shrinks a webpage to almost as little as 10% of it’s original size. So when it comes to viewing webpages, Opera Mini users can browse a lot more of them within a set data limit as compared to other mobile browsers. Let nothing stop you from experiencing the World Wide Web. Hurry up before the web passes run out! Happy surfing! Previous article: How can smartphone OEMs standout from the crowd?Next article: Stay fashionable with Myntra.com on Opera Mini!